Three U.S. lawyers have notified us that they’ve been contacted by the purported Meg Li Martinez with regards to a to a collaborative family law agreement dispute. This is a fraud we have seen before under several other names and similar scenarios. For examples of other names attached to this kind of fraud see our Confirmed Fraud Page. For an explanation of how this fraud works see our Fraud Fact Sheet. Thanks for your responds, I am glad for the opportunity given me to explain everything concerning my case to you. I can also be reach on (253)785-0889, or my private number on (617) 383-7494 . but am presently going out to check on my cousin who is admitted in the hospital. I don’t really know when I will get back home but it is imperative for me to give you a detailed rundown of my legal issue with my ex-husband. I may likely call you later today. 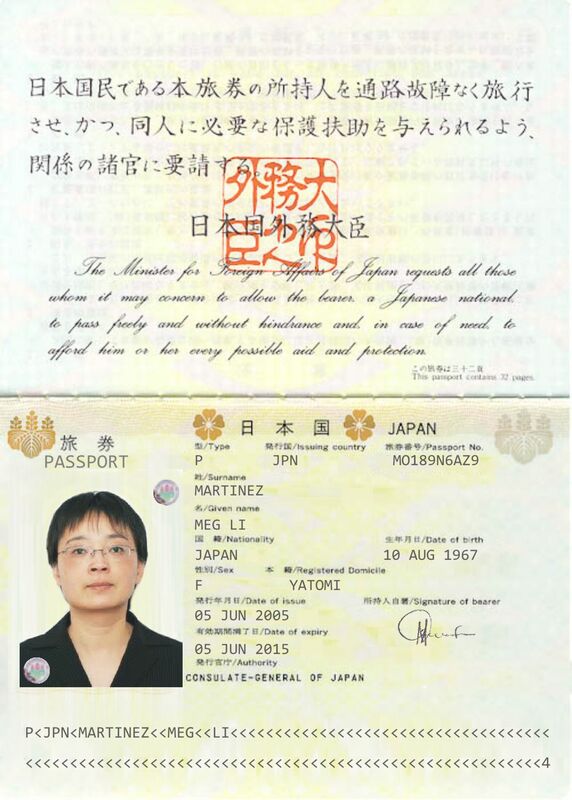 As, you know my name is Meg Li Martinez I was born 10th August 1967 by Mr and Mrs Johnson Li Williams, I got married 3rd of October 1997 at Fukuoka Family Court in Japan. I work with Tang Technologies and presently the regional supervisor of the company. I have 3 kids for Charles Martinez (ex-husband) Lauren Martinez 15yrs,Sumiko Martinez 12yrs and Chikako Martinez 10yrs. My ex-husband is a citizen of the United States of America and lives (Suffolk County,Massachusetts). We started having issues when I discovered that he was having an affair with a lady who got pregnant for him. I filed for a divorce and was granted on the 6th of December 2012,whereby we entered into an agreement for child support, spousal support and Medical support. The family support agreement was total $593,400 and on that same day we entered into the agreement he paid the sum of $252,800 balancing the sum of $340,600 which was suppose to be paid to me by February 28th 2013.Up till today he has not paid even a dollar from the balance sum. During, my findings to take legal action against him, I was advised by my former attorney that I can only seek fair hearing If only I retain an attorney who resides in his jurisdictions. I carried out a little research and found your firm under the same county where he lives and I also looked into your legal success and professionalism which is satisfactory. Also, I will want you to know that my ex-husband has the financial capacity to pay the balance that he owes (our family, my 3 children and I) .I know vividly that with your legal understanding of my case compelling my ex-husband with the Agreement and decree we both entered enforcing the court order will not be difficult or complicated. I am also optimistic that if your firm sends him a demand letter about the legal implication of his breach of the court order, it will create a rapid responds from him. However, when am back from the hospital hopefully by tomorrow but if not, I will instruct my eldest son Lauren Martinez to Scan and send you the copy of the Decree of Divorce and Separation Agreement. I will want this case to be handled with utmost commitment and time is very essential I will be pleased to send you further information’s about my case and I shall send your firm the Hard copies of the documents in my possession when retained. Kindly send me a copy of your draft agreement to have a better understanding of your firms terms and condition if acceptable by me. I look forward to hearing from you soon and also expect my calls soonest. Ditto Mike Hynum’s reply dated May 28, 2013. We received the exact same thing… Binghamton, NY. Same name, same amount, same spouse (but resides in Binghamton). She had the gall to actually call me. Bold scammer. Our firm got contacted by this individual as well. Definitely a scammer. Our firm received the same e-mail on June 10, 2013 … searched the information through Google and found this post. Thanks for the information …. Just got her email today w/attached docs. Amazing that her Japanese court papers are entirely in English! The twist here is that she told me my colleague referred her to me (and dared to copy in the colleague) who wrote me & said she had definitely NOT referred her. Sad that they spend so much time on dishonest crap when they could be doing something positive in the world. Like working. My office got scammed by Ms. Li as well. We got a little farther in the process and I wanted everyone to know her process. We received the same email on 6/14/13. She sent us those same documents that appear above. Once our firm started looking at the case, Ms. Li informed us that she contacted her ex-husband and he wanted to handle this out of court. We were told through her by email that Mr. Martinez would be sending us a check. A few days later we received a PNC Bank cashier’s check in the amount $297,500.00. After we received the check Ms. Li sent an email saying that her son was in the ICU and was going to need surgery. The day we deposited the check she called from an anonymous number, wanting to make sure we received her email about how to wire her the funds. At this point I called PNC Bank to question the check and the time for deposit. I was told that the check number was not a proper check number, and that it was most likely a fraudulent check. Shortly after that news we received an email from Ms. Li stating that the hospital needed the money in order to perform life saving surgery on her son by 2:00 p.m. our time. Our assumption is that she was expecting us to front the money for the check in order to save her son’s life. At this point we googled her name and found this thread. The check deposit has been cancelled. California Attorney here. I got something very similar between a claimed Tama Wu Kenneth v. Mason Kenneth. The scammer has new paperwork but same old story. A Japanese version and an english translation of the decree and settlement to boot. She claimed there was an Osaka Family Court marital settlement of child support owing of 300K+. Checked with the Japanese Courts and there was no such case. Moreover I ran background checks and the names were fake. We’ve received emails from her twice now, the first almost 8 months ago and with a slightly different name. Same paperwork and picture the first time, I didn’t bother emailing her this time of course. Received an email from her about 8 months ago, it included the same documents as described above. It seemed suspicious to me so I never did anything for her. Just got another email from her with a slightly different name, googled it, and found this. Same story here. After I told her to contact the attorney general for child support collection help her story changed: “Thank you for your prompt response. Am living in Japan and Bill Anderson (ex-husband) lives in Weslaco, TX . Due to the time difference (+13hrs EST) it is a little bit difficult to determine the best time to call you. Following our divorce, we agreed under a negotiated settlement agreement which is incorporated, merged into and made part of the court decree for a one-time payment of $878,650.00USD for Family support (this includes child support, alimony and medical support). To his credit, he has paid me $201,600.00USD but still owing $677.050.00USD and the due time for completion of payment is over. Thus, I request your legal counsel and representation to enforce the final judgment thereby compelling him to remit the balance owed me. He is aware of my intention to seek legal actions. Attached is a copy of the separation agreement, and Final Judgment and I will be pleased to provide further information on this case on request. I desire to retain your law firm, please forward your firm’s retainer fee agreement so that we can proceed. Thank you and have a pleasant day. I responded to her stating that I believed her request was a fraudulent scam and that she should no longer contact me or my law firm. Be careful out there. Lots of scammers now a days. Got a similar one where the potential client claimed to be a legitimate doctor who was relocating to my area and needed a house between 300k-600k….almost duped a realtor friend of mine. Our firm in Nelson, BC, Canada just got contacted by a person with a similar story and identical documents, just with names and dollar figures changed. The names of the couple in my case were Dina and Romio Dalton.